This page provides an overview of the Liverpool Telescope's fully autonomous robotic systems. The operational implications for the astronomer ordering observations from this robotic telescope are addressed chiefly in the Phase 1 and Phase 2 proposal application pages. However, it's recommended users read this page as well if one wants to gain a more well-rounded understanding of this telescope's systems. Although the Liverpool Telescope (LT) is a robotic telescope, by "robotic" we do not mean that the telescope is operated by remote control. Instead, the telescope runs autonomously; that is, it runs by itself with no human being at the controls. The Robotic Control System (RCS) is effectively a robot user that reacts to events as they occur. In the traditional, manned observatory, a duty astronomer must continually be weighing together many factors during the course of an observing run in order to make an appropriate decision on the course of action at that time. Weather conditions may force suspension of the observing program to protect the telescope, later, when conditions improve the program may resume. Power outages may force controlled shutdown of computers and other hardware. Changes in atmospheric conditions may require on-the-fly changes to the scheduled program. Reliability: the system will be left unattended for long periods and so must continue to function through power failures and periods of lost internet connection without human intervention. Fault-tolerance: the telescope system should be able to continue operating sensibly but perhaps with degraded performance when instrument and other subsystems become unavailable. Adaptability: - deployment to other telescope systems is envisaged so the model needs to be readily extendable to work with different TCS and ICS configurations. Configurability: - the RCS needs to be readily configurable in order to take into account varying operational requirements and hardware configuration over time without the need for major software re-writes. Efficiency: - it should make best use of available time by taking into account environmental conditions and availability of system resources - e.g. instruments, autoguider etc in its operational planning. Every opportunity should be taken to increase efficiency by performing operations in parallel. This is the primary observing mode. The RCS requests groups of observations from the scheduler operating on the observing database (ODB). A plan of execution is then devised by decomposing the set of required operations - this can include slewing onto target, setting the rotator configuration, selecting and configuring the instrument(s), making focus adjustments, selecting an autoguider and finally requesting the exposures. In building the plan, consideration is given to which tasks can be performed in parallel, the required sequencing of observations to be made, the current telescope and instrument setup, engineering restrictions, time restrictions imposed by other operating modes and the approach of sunrise. Commands are sent to the telescope and instrument controllers to implement the plan. On completion of a group of observations the observing database is updated to reflect the current execution status of the group and the accounts are updated to reflect resource usage. This priority mode of operation is controlled by an external software agent triggered by event notifications (e.g. GCN). The external agent can override any scheduled science or real-time operations and take full control of the telescope for a period by sending task requests using a special command interface. The TO control agent provides execution status information back to the software agent. When conditions are too poor to allow the normal science programs to run, this operating mode is used to monitor conditions to check for improvement - e.g. seeing/photometricity/cloud cover. A series of photometric standard targets are repeatedly observed and atmospheric statistics derived. The scheduler provides the RCS on request with groups of observations to perform. The current scheduler is a simple despatch scheduler which is run on demand. The set of available groups in the observing database is searched to generate a candidate list of those for which all observing, timing and implicit constraints are satisied. A weighted score is generated for each such group using the metrics below. The group with the highest score is then selected for observation. a principle advantage is that in a potentially rapidly changing environment, the selected group is always the one that is best matched to current conditions. the main disadvantage is that the group so selected is not neccessarily selected at the time which is actually best for it, as there is no look-ahead facility to to allow consideration of varying future conditions or to examine alternative future selection scenarios presented by making possibly sub-optimal selection at the present time. Monitor - can run during any of a number of windows of specified size and at specified interval between the start and end dates. A monitor group will only be attempted once per window. Phased - can run on any ONE of a set of (usually narrow) windows between start date and end (cutoff) date. The windows occur around a specified ephemeris phase. Fixed - are required to run at a single precise moment and take precedence over all other types of group. Actually there is a small window allowed since it would be possible to miss a fixed group if e.g. the weather suddenly improved shortly after the group was due to have started. Interval - repeat observations to be run as soon as possible after minimum interval since previous observation has elapsed. 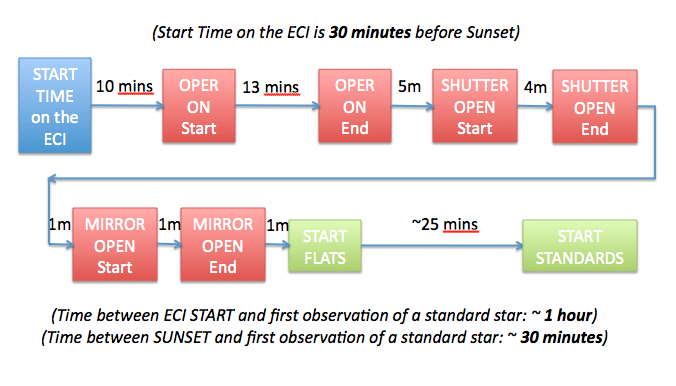 Note: the timing "windows" mentioned above refer to when the group starts its observing run; the finish time is still defined by the full execution time of the group. For example, given a group with a 2-hour execution time and a window between 2100-0000UT, the observations could be made between 2100-2300UT or as late as 2359-0159UT, depending on scheduling competition with other groups, weather conditions, etc. Seeing - the worst level of atmospheric seeing under which a group is permitted to be observed. A group can be observed in better conditions but not worse. Seeing is determined from real-time reductions of science and photometric standard frames as they are obtained. Corrections are automatically applied for zenith distance and filter wavelength. The seeing value you set in the observing constraint is compared against the scheduler's prediction for the what image quality will be acheived in the r-band taking into account the current airmass of your target. For example, if you request average seeing conditions, the scheduler might attempt the observation at any airmass if the current seeing is very good, but if the seeing is only average it might reject your target when low on the horizon because it predicts the conditions will be poor there. Scheduling is always performed on an assumption of r-band so you might expect for example, u-band images to show FWHM larger than the criterion set in the observing constraint. The seeing constraint is set as a numerical value, full-width-half-maximum in arcseconds. The scheduler is specified to attempt an observation when we estimate there is an 80% probability of achieving the specified FWHM when the group is started. Sky brightness - A relative sky brightness (described in terms of magnitudes brighter than the best case true dark sky) is predicted from a model based on solar position, lunar elevation, lunar phase and lunar separation from telescope pointing. A group is scheduled only if the predicted sky brightness is darker than the specified criterion for the entire predicted execution duration of the group. Hour-angle - it is possible to specify HA limits for observing a group - ALL targets in the group MUST fall within the specified limits in order to be observed. Ignored by FIXED groups. Airmass - A maximum airmass can be specified - the target(s) must remain above the corresponding elevation for the duration of the group. Ignored by FIXED groups. Extinction - Photometric conditions may be specified - these are determined manually, early in the night and remain in force for the full night. I.e., they are only a rough guide to the conditions expected for the coming night. All targets in a group must be visible above the dome horizon (typically 20 - 25 degrees depending on any engineering settings) for the full duration of the group. Targets must not cross the zenith exclusion zone during an observation. This is a narrow zone around the zenith caused by speed limitation of the cassegrain rotator. Minumimum zenith distance is 2 degrees. A group will not be attempted if the specified rotator setting will allow the cassegrain rotator to reach a limit (currently the range of mount angles are: -87 to +87). The RCS imposes time limits by which groups must have completed such as for performing calibration observations. Groups will not be selected if they are expected to overrun into such periods. Groups will not be selected if they are expected to overrun into daytime. A group cannot be selected if the containing proposal's total time allocation has been used up. If a proposal is outside of its activation period no groups can be selected from it. No target in a group may cross outside any temporary axis range - these may be imposed for engineering reasons from time to time and will be advised via the website. If any observation in a group specifies an unavailable instrument, or a configuration which is not currently available for an instrument, or the instrument is impaired,the group cannot be selected. If a fixed group is due before a candidate group can be expected to complete (with a short buffer time to allow slewing onto target) then that group cannot be selected. Autoguider - it is possible to specify whether a group MUST use the autoguider, may use it if available or must NOT use the autoguider. If the autoguider is reported as unavailable, groups for which its use is mandatory will not be selected. Groups which fail to execute for some reason will become schedulable after a veto period which depends on the reason for failure. E.g. groups with mandatory autoguider use which have failed due to autoguider target acquisition problems are vetoed for 1 hour to avoid repeated failures using up large chunks of time. Groups which fail through external reasons e.g. bad weather or target-of opportunity interrupt, are available for rescheduling immediately the external condition has cleared. Repeating groups have a higher priority to one-off groups. Urgent groups have higher priority. Transit height fraction of target(s) - ratio of current elevation to highest elevation in night. Closeness of matching of actual seeing to that requested. Run-up of the system in the evening is outlined in the following diagram. Note: "ECI" refers to the Engineering Control Interface which is a front-end for the Master Control Program (MCP) that runs the telescope's basic systems. Thirty minutes before sunset the MCP releases its lock on telescope activities, allowing the RCS to issue startup ("Operational on" or "Oper on") commands. Exactly 30 mins before sunset: the Robotic Control System issues an "operational on" command, which should lead to the powering up of the system nodes, hydraulics, etc. At sunset: the RCS initialises the observing system by opening the enclosure followed by the mirror covers. This process takes up to 5 min. The system will then start obtaining twilight sky flats. Down to Solar elevation -10°: the telescope usually spends 25-30 minutes on sky flats. It will then either take an initial set of standard star observations (so that sky conditions can be assessed) or it will immediately start science observations. Science groups with extremely relaxed sky brightness constraints may be observed instead of the initial set of standards, or even shortly after the telescope has opened, i.e. instead of sky flat observations. However, for most users the sky will be too bright at this time. For details on sky brightness (and other) observing constraints please see the Phase2 guidelines and/or the Sky Brightness web-page. The telescope usually obtains sky flats at the end of the night (to complement those taken at the beginning) during morning twilight. However, science groups with extremely relaxed sky brightness constraints may again be observed at this time. sun altitude -9.0° (~45 mins before sunrise): end observing, start morning calibration; sky flats. sun altitude -3.0° (~15 mins before sunrise): "operational off" command given; telescope parked, mirror cover & enclosure closed, system nodes etc powered off.